MUFF WIGGLER :: View topic - EURO x0x-heart - Complete "Kit"
EURO x0x-heart - Complete "Kit"
you probably wont need standoffs. there are so many headers, that friction is good enough. thanks but some of those links don't work - I will be updating links - would be awesome if everything was from Mouser sice original BOM is from there....as people comment..
here are the jacks. there are a choice for the nuts, and they are not included with the jacks, but are available on the site. ok, the BOM has been updated with working links. thanks for pointing that out. 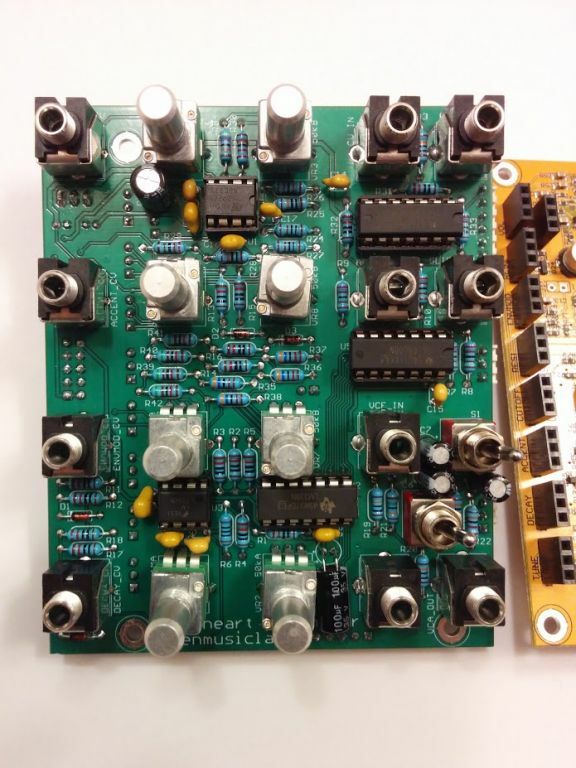 Will those hi quality jacks from synth cube work fine? what should rotation angle for the pots be? also I don't understand what 50k - A and B is - what is A nd B>? would this one work for 50k ones? would this be 50K A or B? B is linear taper and A is logarithmic or audio taper , you want right angle pc mount. unfortunately, no single store carries every type of pot. unlike resistors, where a 1/4W, axial resistor is pretty much the same regardless of manufacturer, with pots there are hundreds of different 10k pots. you can get linear taper, log taper, reverse taper, center tapped. you can have 6mm, 1/8", or 1/4" shaft, which can be knurled, flatted, slotted, star (of 2 varieties), or smooth. the shaft can also be of 6 different lenghts, and the body width can be 9mm, 12mm, 24mm, round or square. it can be single gang, or up to a dozen pots in one body. it can have concentric shafts for controlling two pots in one, and one of these shafts can have a push/pull switch, which can either be momentary or latching. some have collars, others do not. some of those collars are threaded, others are not. pots are truely the bane of my existence when it comes to designing synths. This is usually how it is unless you buy kits, you will have to get parts form different sources. I usually do Tayda , Mouser and Smallbear and then still end up buying things like jacks, and power connectors in bulk from other places. cool thanks, just curious what is this REV Audio they have on the pulldown? that stands for reverse audio. basically the resistance goes down instead of up as you turn it. with a linear taper pot you can just wire it backwards to get this effect, but as an audio pot has a log taper, you cant do that so easily. Its another type , reverse logarithmic taper or Anti-log. If a BOM says C50K (or C and a different value) it means reverse logarithmic. what about headers and connector for power cable? Is this the correct spacing for both of them? the mouser cart had all of the SIP female and male headers on it. it didnt have the power connectors, though. the pacemaker board is pretty cramped with parts, so a shrouded power connector doesnt fit so well. it can be made to fit, if you really want to have a keyed connector on there. otherwise, a nonshrouded will work as well, youll just have to make sure you put the cable on the right way. I think I got it all , can you please take a look at the first post and confirm all is there to build this module. can anyone who build xox-heart euro take a quick look at the first post and see if I'm missing anything?